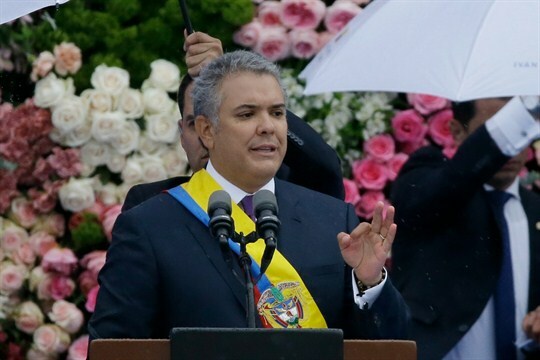 Wearing the presidential sash, Colombian President Ivan Duque speaks during his inauguration ceremony, Bogota, Aug. 7, 2018 (AP photo by Fernando Vergara). Three days before Ivan Duque was sworn in as Colombia’s new president on Tuesday, a scene of cinematic mayhem unfolded in neighboring Venezuela. On Saturday, President Nicolas Maduro was delivering a speech at a military parade in Caracas when the formations suddenly scattered in a flurry of panic. Armed drones reportedly packed with explosives had detonated near the reviewing stand in what looked like an attempt on the president’s life. Barely three hours later, Maduro, who was not hurt, went on television to make a stunning accusation. The attack, he claimed, could be traced to Colombian President Juan Manuel Santos, the man who was about to leave office.